Norwegian company Skangas, a subsidiary of Finland’s Gasum and operator of a complete value chain in liquefied natural gas (LNG) to serve the Nordic market, has joined the LNG industry coalition SEA\LNG. The multi-sector coalition, aiming to accelerate the widespread adoption of liquefied natural gas as a marine fuel, has welcomed the addition of Skangas for its extensive LNG supply and infrastructure expertise. Skangas joins the coalition’s growing roster of 34 members. A leading LNG provider in Northern Europe, Skangas brings considerable industry knowledge of LNG production and sourcing, and the construction of key LNG infrastructure for marine deliveries, from land-based infrastructure to LNG bunkering vessels (LNGBVs). 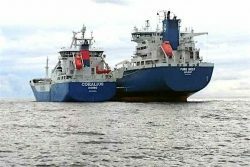 Among its fleet is the bunkering vessel Coralius, which conducts ship-to-ship operations primarily in the North and Baltic Seas.